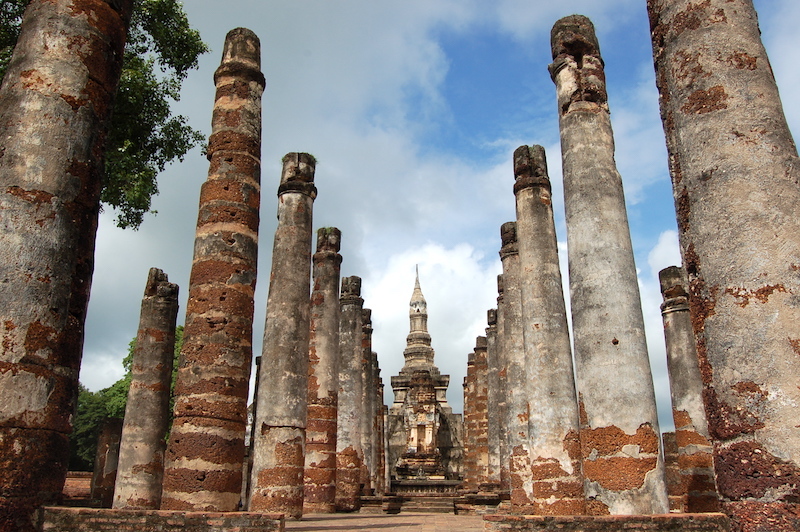 The ancient city of Sukhothai is home to some of the most impressive temple ruins in Thailand. 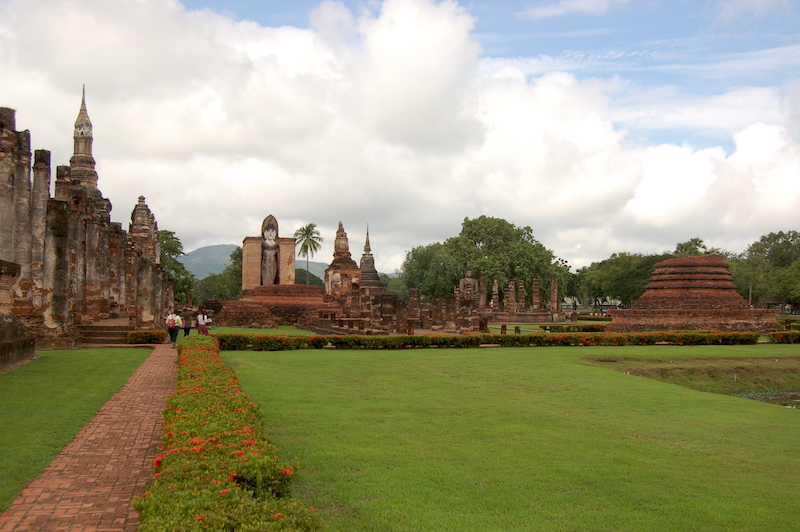 Located 400 km north of Bangkok, Sukhothai was the first capital of the Siam Kingdom. It marked the golden age of Thai civilization, back in the 13th century. 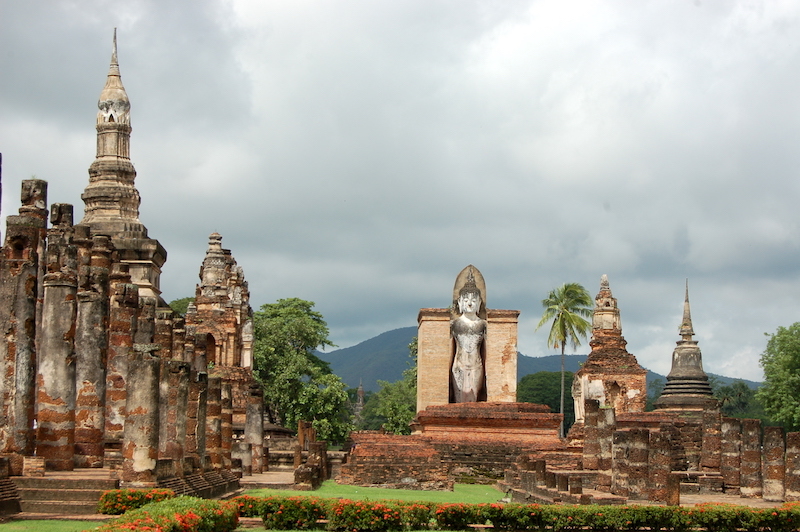 Established around the year 1238 by the King Ramkhamhaeng, Sukhothai literally means “the rising happiness”. 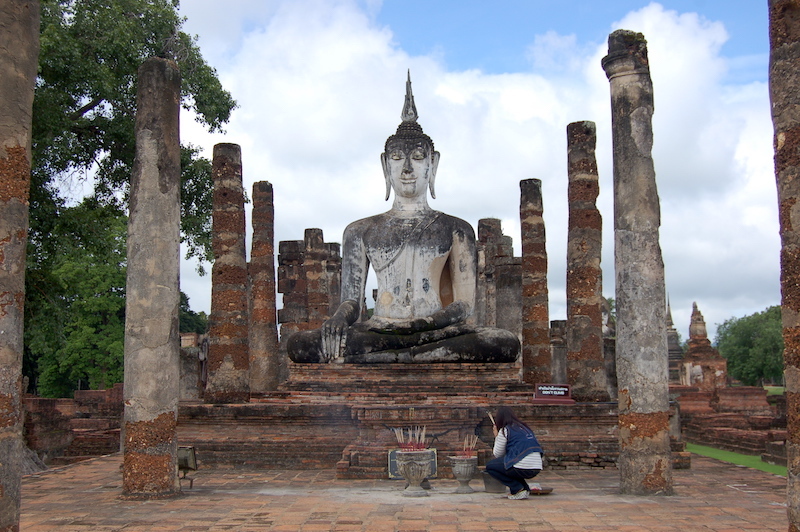 Likewise Ayutthaya, ancient Sukhothai became a National Historical Park, with numerous sites of historical interest. Its ruins and monuments are particularly remarkable and the province was designated a UNESCO World Heritage. The National Historical Park lies 12km from the center. The best way to reach it from the new part of the city is by tuk-tuk. Once there, you can rent bikes to better explore the ruins (the site covers an area of 70 km2 ). 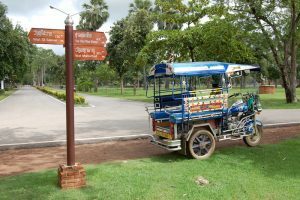 Another possibility is to hire a guide and explore the area by tuk-tuk. You can rent bikes at the shops opposite to the entrance of the Historical Park. It is also possible to explore the park on foot, but you probably wouldn’t be able to see as much. The park has 5 geographical zones, each of which has its entry fee (100 Baht in 2015). You can get free maps to visit the places at the ticket offices. The Park includes the remains of 21 historical sites within the old walls. You can find an additional of 70 other sites within a 5km radius. The central zone is the main one and contains 11 temple ruins, amongst lakes, small islands, bridges and moats. It was an amazing experience to bike through the highly preserved temples and fascinating landscapes while imagining the Kings who dwelled there some 800 years ago. One of the most photogenic places I’ve been! One of the most spectacular temples is Wat Mahathat, with a large Buddha sitting amongst huge pillars. The temple also has a central chedi flanked by two standing Buddha figures. The north zone is also definitely worth a visit, with remains of temples, buildings and gigantic Buddha images. Because there are so many different temples in the area, it’s not worth mentioning and recommending each separately. For me, the best way to experience the area is to rent a bike and allow yourself to get lost exploring the seemingly endless extension of gardens, columns, Buddha figures, lakes and towers. 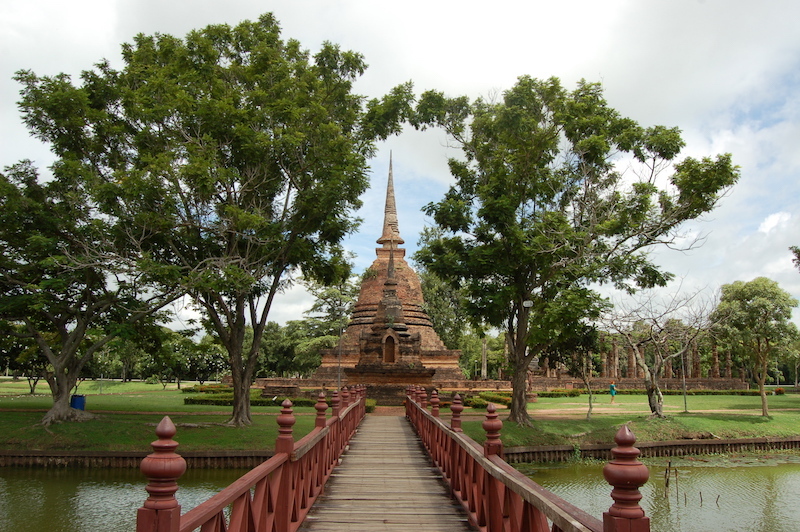 One of hundreds of chedis in Old Sukhothai – each one singularly amazing! New Sukhothai is not a particularly interesting town per se, but it’s a pleasant base from which to explore the National Park. With a relaxed and friendly atmosphere, the town offers excellent-value accommodation and good transport links. I stayed in an awesome little guesthouse, in a large private room with bathroom and double bed and breakfast included for U$ 13! You can reach Sukhothai by train and bus. 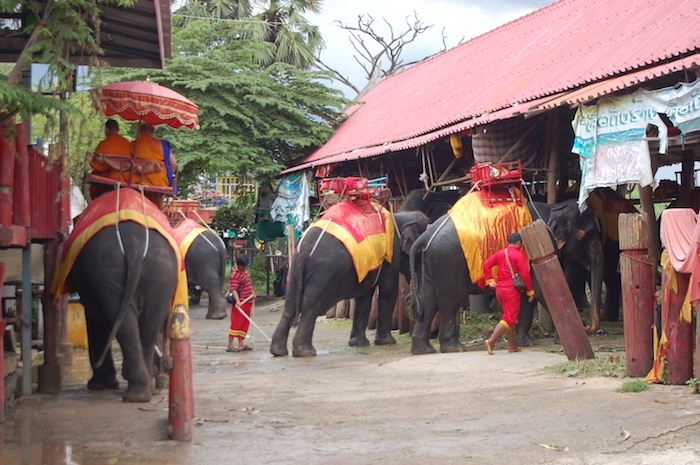 The trip takes around 7 hours from Bangkok and 4 hours from Chiang Mai. 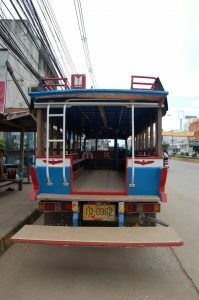 When I arrived from Ayutthaya, I got really angry at the tuk-tuk drivers in the bus station. They were offering rides 5 times more expensive than what they should cost! Be aware, it is always good to know more or less how much a trip would cost, to avoid being so easily fooled! (Unfortunately I don’t have that information anymore, but I had checked on my guide and they were really overcharging). 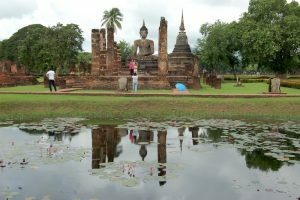 Can’t decide between Ayutthaya and Sukhothai? The same doubt tormented me and in the end decided to visit both in 4 days. If you have the time, I’d definitely recommend doing it, as they are different places. Even though Ayutthaya has a more interesting historical narrative, Sukhothai’s ancient city is better preserved and architecturally more alluring. If you have the time, visit both! Thanks for liking, commenting and sharing! Without doubt, Ayutthaya is worth a visit. 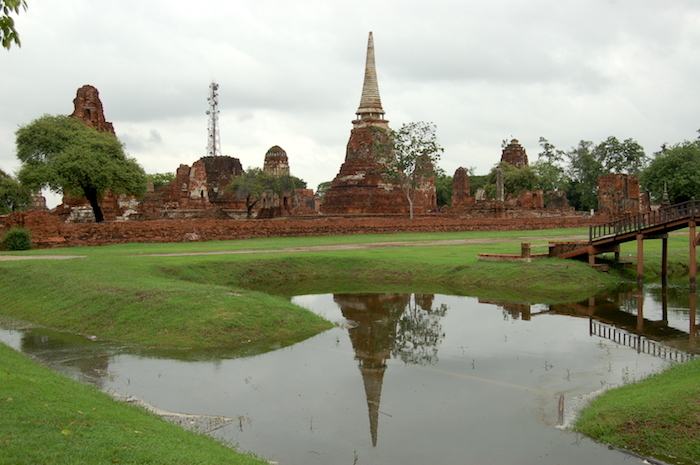 The fabled and fallen city of Ayutthaya was the capital of the Kingdom of Siam. It was a prosperous and important trading port since 1350, until the Burmese sacked it in 1767. 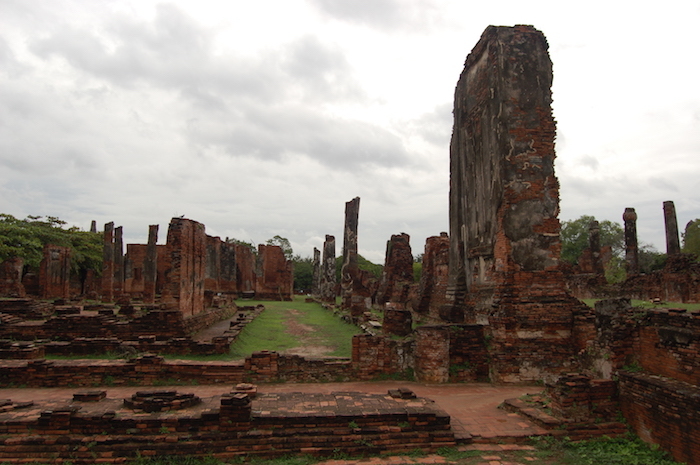 This forced the Thais to flee Ayutthaya and re-establish in what is today’s Bangkok. 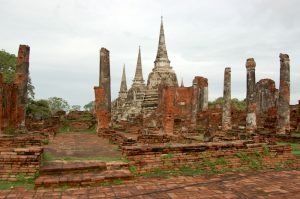 They left behind dozens of temples of great historical and architectural importance, which have become a UNESCO World Heritage Centre – the Ayutthaya Historical Park. The modern Ayutthaya is a rather unexciting provincial town. 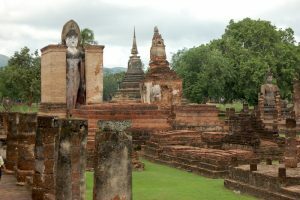 But the remnants of the old empire contain some of the most astonishing temples and ruins in Thailand. 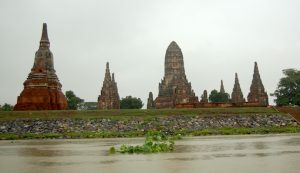 Ayutthaya’s ruins spread throughout the city center and along the surrounding rivers. The best way to visit the ruins on the island is by bike and to visit the ones alongside the rivers is by boat. Most guesthouses organize both bikes and boat tours. 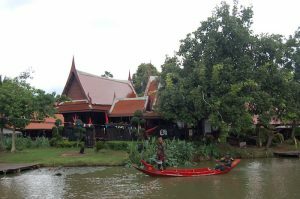 I stayed at a neat hostel by the side of the river, whose owner was probably the sweetest Thai woman alive. She did everything to make our stay comfortable and enjoyable, from organizing bikes and boats to suggesting the best meals and deals in town. I got to the hostel at the same time as Julia, a German girl. She was 20 years old and had just started to study industrial engineering in Karlsruhe. She was also traveling alone and we decided to explore the city together. We were sharing our room with a guy from India, who was a programmer and worked from anywhere in the world where he could find internet connection. He travelled around with his laptop, working from hostels and cafes and exploring new places on his free time. He couldn’t join us on our exploration because he had an important project due. Julia and I rented bikes and went together to the floating market. I loved it (despite the fact that it was not the same as the images you get if you Google ‘floating markets’). There weren’t so many boats selling stuff, but actually the whole structure of the market was built on water. There you could find everything, from spices to clothes, to sculptures, to food. Suddenly, a group of warrior-dressed men began to perform some kind of theatre on boats on the lake. They even had fire-works! But then it began to rain and they had to stop it. Welcome to Thailand during the rainy season! 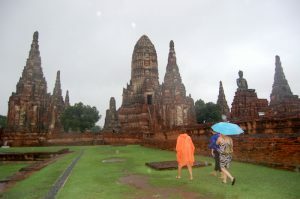 We rode back to the hostel in the rain and went on a boat tour around the center to visit 3 majestic temples. Two other girls from the guesthouse joined us: one from Canada and the other from the Netherlands. 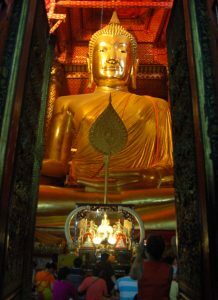 The first temple we visited was Wat Phanan Choeng, with an impressive 19-m high golden Buddha. Unlike most of the temples in Ayutthaya, this one is an active and busy place of worship and ceremonies for the local population. 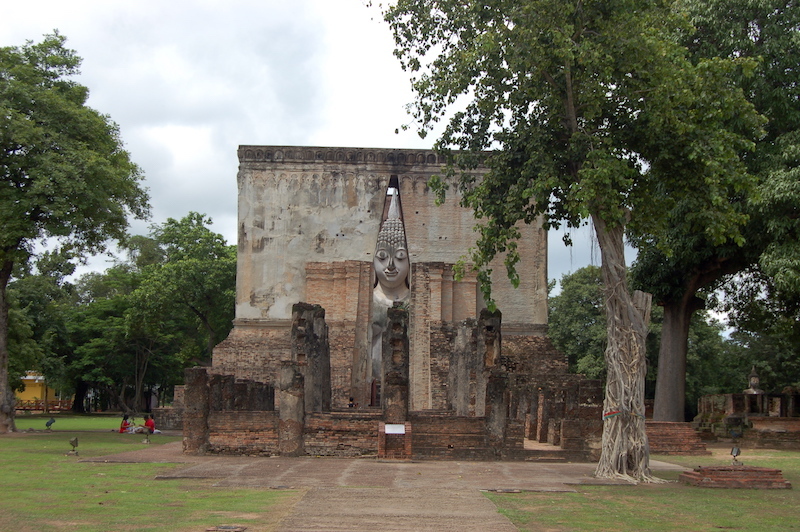 The next stop was at the ruins of Wat Chai Wattanaram. It has an impressive main prang (tall tower found in temples, usually richly carved) surrounded by many other smaller prangs and towers. It was built in 1630 and is believed to host relics of the Buddha. 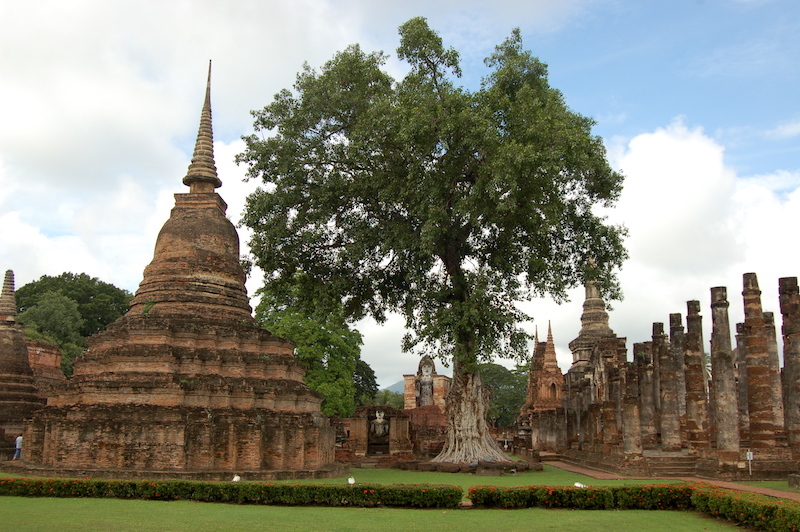 Temple Wat Phra Si Sanphet – the three chedis are believed to keep the ashes of three kings. We then visited Wat Phra Si Sanphet, with its three chedis that are the most iconic image of the Ayutthaya Historical Park. People say the chedis store the ashes of three former Siam kings. In addition to these temples, we saw many others from the water. It rained all the way through the tour, which made it difficult to take decent photos. So my best pictures of Ayutthaya are actually stored on my memory’s photographic film, and not on my memory card. After the boat tour, the 4 of us went out for dinner together and 2 other girls joined later on. It just struck me that all of us were girls traveling alone! There we were, 6 girls from all over the world, traveling through Southeast Asia on our own, telling stories and sharing experiences, while having dinner on a cheap Thai restaurant in Ayutthaya! How cool is that? On the next day Julia and I went to visit the ruins and temples in the city center. They were absolutely mesmerizing. Most of them are located either inside or in the surroundings of the beautiful Rama Public Park. 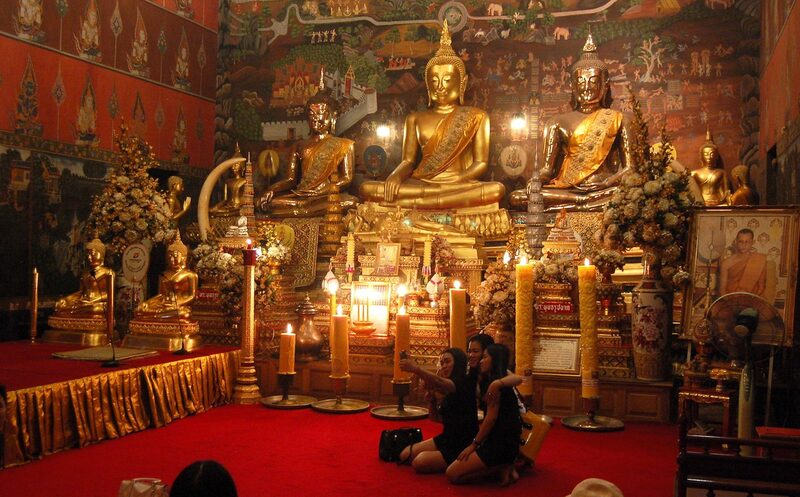 We first visited Wat Mahathat , which is the symbolic center where the Buddha’s relics were enshrined. 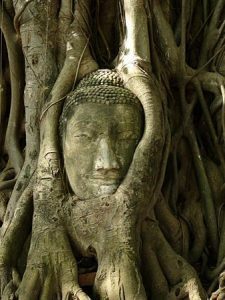 The temple also houses the famous Buddha head in a tree trunk. 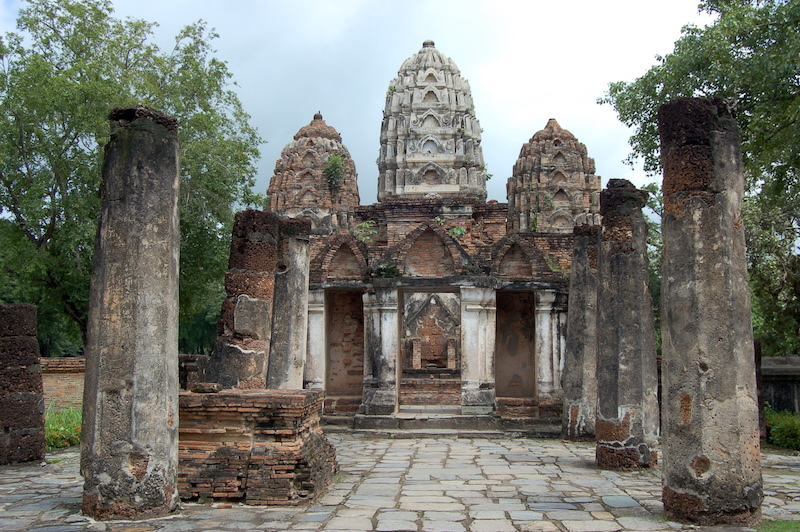 Wandering around, we also visited the impressive ruins of Wat Langkhadum and Wat Sangkhapat. Later, we visited Wat Ratchaburana, which has a very impressive big hall and prang. History tells that two brothers fought to decide who would inherit the vacant throne of Ayutthaya, but both ended up dying. So the younger brother became the King (King Borom Ratchathirat II) and built this temple on the place where his brothers fought and died. 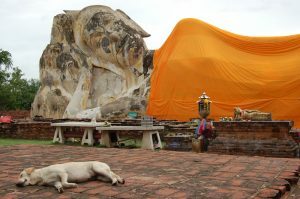 We finished our ruin-exploration tour visiting the largest reclining Buddha in Ayutthaya, located in the ruins of Wat Lokayasutharam. The Buddha is 37m long and 8m high and has his head reclined on a lotus flower. Behind the image, there are also remains of ancient temples, but honestly not as impressive as the ones in Rama Park. Definitely, Ayutthaya is worth visiting. The temples and ruins are alluring, accommodation is cheap and it’s pretty easy to get around, as well as to and from there. 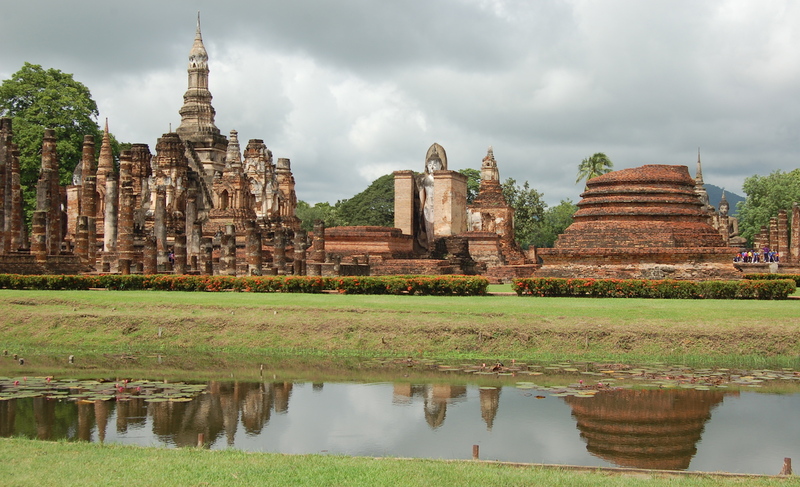 I’d say two days are ideal to visit the main temples and ruins, but there are also day trips from Bangkok. To get to Ayutthaya you can catch a minivan from the Victory Monument in Bangkok or a bus from the North bus station. Both last about 1 ½ hr and cost around 60B. You can also choose to catch a train, which also takes 1 ½ hr and costs from 15 to 350B. I’m Ana Terra and this is my blog. Here I share my adventures and experiences in India and other countries I’ve been to. I’m passionate about traveling and I believe it can profoundly transform our lives, bringing joy and power back to us. I’m Ana Terra and this is my blog. Here I’ll share my adventures and experiences in India and other countries I’ve been to. I’m passionate about traveling and I believe it can profoundly transform our lives, bringing joy and power back to us.